Tucked within the sycamores and oaks of the 477-acre Irvine Regional Park lies the OC Zoo. 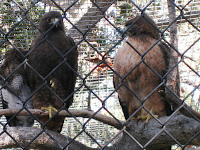 An ideal setting to exhibit animals native to the southwest, the OC Zoo features black bears, mountain lions, bald eagles and other animals that have been injured or are not releasable to the wild. Ashley and I recently had a chance to visit the Orange County Zoo, which is one of the "main" attractions located inside Irvine Regional Park. 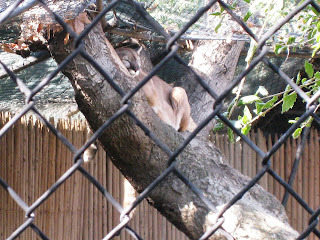 The Orange County Zoo is definitely worth visiting and it will be fun place that the whole family will enjoy. We found the OC Parks staff here friendly and very helpful with any questions you have about the animals. For more pictures of the animals at the Orange County Zoo from another time we visited make sure to check out our Facebook Page. Directions to the Orange County Zoo: Coming from the 5 freeway, exit at Jamboree going toward the mountains (away from Irvine). Jamboree dead ends at Irvine Regional Park, several miles from the 5 freeway. The Orange County Zoo is located inside Irvine Regional Park and the park’s address is 1 Irvine Park Road Orange, CA 92869. A map of where the Orange County Zoo is, can be found Here. We parked in parking lot 21 located on the park map. You could also park at lot 4 or 19, which also provide easy access to the trails at the park. A map of the hiking trails and where the animal exhibits are at the Orange County Zoo can be found Here. A brochure for the Orange County Zoo can be found Here. 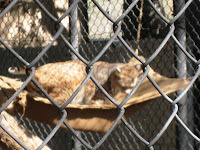 Description of the Orange County Zoo: The Orange County Zoo does charge for Admission in addition to the cost of entering Irvine Regional Park. The cost of the fee is $2.00 per person ages 3 years and up. Anyone under the age of 3 is free. The cost of entry to the Irvine Regional Park is $3.00 per vehicle on weekdays and $5.00 per vehicle on weekends (Major Holidays: $7.00 to $10.00 per entry as posted). The Orange County Zoo is open daily from 10:00am to 3:30pm on weekdays and is open 10:00am to 4:30pm on weekends (except Dec.25 & Jan. 1 as the Orange County Zoo is closed those days). 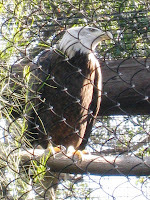 The Orange County Zoo is located inside the Irvine Regional Park in the city of Orange. The Zoo is nestled among this majestic 477 acre wilderness park. 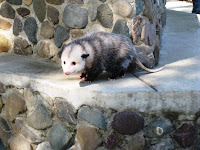 The Zoo's focus is on animals and plants who are native to the southwestern United States. Animals on exhibit include black bears, mountain lions, bald eagles, island foxes, ocelot, red-tailed hawk, great horned owls, porcupine, coyotes, turkey vultures, coati and more. The zoo also features a barnyard with domestic goats, chevoit sheep, jacob sheep, pot-bellied pigs, doves and pheasants. 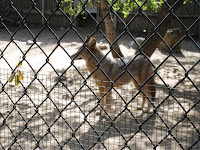 Further Thoughts: Ashley and I both enjoyed our trip to the Orange County Zoo. The zoo is well maintained and was very busy the weekend that we went to visit. It is a very popular place and it was easy to see that most people were enjoying their visit. The best part about the Orange County Zoo is that it contains many animals that you have the possibility of seeing while out hiking on the trails in Southern California. The cages for the animals appear to be a good size for most of the animals. 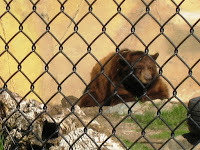 Ashley and I have seen zoos with smaller cages for similar types of animals. While you are there, you will notice than many of the animals have obvious injuries to them and that is why they are at the Orange County Zoo, because they would not survive any longer in the wild. The Orange County Zoo specializes in rescuing injured Southern California wildlife who could not be re-released into the wild. The zoo staff was very helpful and pleasant when we visited. They brought out a tarantula to show us, as well as an opossum which we got to pet. This is a great place to bring kids and show them what types of animals live in the wilderness areas near our communities. Another great thing is that the cost of admission is only $2 per person! Rating: Elevation Gain: Minimal (Very Easy), Distance: 0.25 Miles Roundtrip (Very Easy). Wonderful and comprehensive blog for outdoor hiking activities in Orange County, without need to search out individual locals.